PURA VIDA: In mountaineering, success isn’t always what you think. 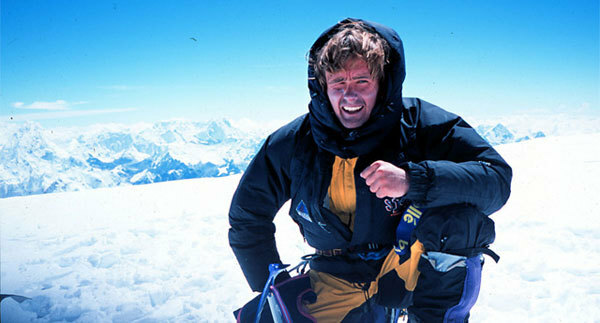 Spanish climber Iñaki Ochoa de Olza died on Annapurna in 2008. In thirteen short years the Whistler Film Festival has become one of the preeminent showcases of its kind. Though set in an internationally renowned ski resort, it keens less toward the outdoor-culture-focused likes of a Banff or Telluride and more toward the independent film and pseudo-Hollywood hot-box of a Sundance. There is, nevertheless, a juried Mountain Culture category typically populated by a handful of decent films. Seldom, however, have there been entries as strong as a pair of this year’s. The Crash Reel, which documents the lead-up to and post-hoc trials of a TBI (traumatic brain injury) to superstar snowboarder Kevin Pearce in the run-up to the 2010 winter Olympics, took the 2013 Mountain Culture prize and deservedly so. It’s one of the best sport documentaries ever made—strong enough to make the final 16 considerations for the Academy Award for best doc. The territory it traverses is pant-shitting scary for any viewer, but perhaps more so for those closest to the action sport risk-reward equation—of which the Whistler crowd was representative. By a combination of sheer luck, his own fortitude and an amazing support system of family and friends, Pearce triumphs over an injury that straddles the knife edge of permanent disability and functional normality. But the post-accident goal to which he aspires and we imagine to be within his reach—a return to competitive snowboarding—is never realized. Thankfully so as Pearce and audience together reach clinical acceptance that “success” in this case means bowing out, understanding the burden he has placed on his family and accepting the physical and mental limitations imposed by his accident. In the end it seems a much better lesson for all than the Hollywood-prescribed arc of comeback athlete hero. In the second movie, The Ridge (Pura Vida in its original Spanish version) “success” in the mountains undergoes yet another conceptual inversion to become—if a definition were possible in this context—little more than a post-hoc measure of survival. For many, the south wall of Annapurna in the Nepalese Himalayas represents the most dangerous climb in the world. To reach the mountain’s 8,091-metre summit, mountaineers must traverse a seven-kilometre-long ridge at 7,500 metres, a huge exposure to such altitude. It’s a daunting task, more so for those who brave this beyond-death-zone without oxygen. So when experienced Spanish climber Iñaki Ochoa de Olza turned back from a summit bid and fell seriously ill while retreating across the ridge in 2008, his hopes of survival were slim. After his Romanian climbing partner Horia Colibasanu gets him in a tent and sounds the alarm over satellite phone, 12 fellow climbers from all over the world strung between base camp and Kathmandu join with Nepali supporters to mount a highly dangerous rescue attempt. This forms the backbone of a story told largely through interviews with those involved on location in their home countries of Canada, the U.S., Switzerland, Poland, Kazakhstan, and Russia. The film’s build is slow and meticulous, the ensuing drama yielding a deep understanding of the gravity of the situation and sheer desperation facing rescuers. Yet the beauty of the film lies elsewhere—in the unselfish and immediate commitment of so many to the rescue, even those who had just finished exhausting climbs themselves; in the giving up, in other cases, of their own objectives to do so; and in the quintessentially human fraternity this represents. As climbers begin moving in teams up the mountain and Ochoa’s pulmonary edema worsens, Swiss superman Ueli Steck reaches him after convincing Colibasanu (who had, by that point, been at that altitude without oxygen for four days) to descend. He administers water and medication, and other rescuers should make it there by the next day. When the attempts to save Ochoa prove futile and he dies, however, it is amazingly anticlimactic—and not just because of Steck’s typically Swiss clinical descriptions. It’s because we now realize that the odds of saving Ochoa were a million to one, that rescuers well knew this and went ahead with the massive undertaking anyway, united in their morality, and all came back alive when there were reasons to suspect some would perish in the effort (4 of every 10 who attempt Annapurna die). Far from failure this depicts a form of success almost beyond measure, a purity of the life experience of mountains, and something The Ridge unexpectedly celebrates… well, more than successfully.